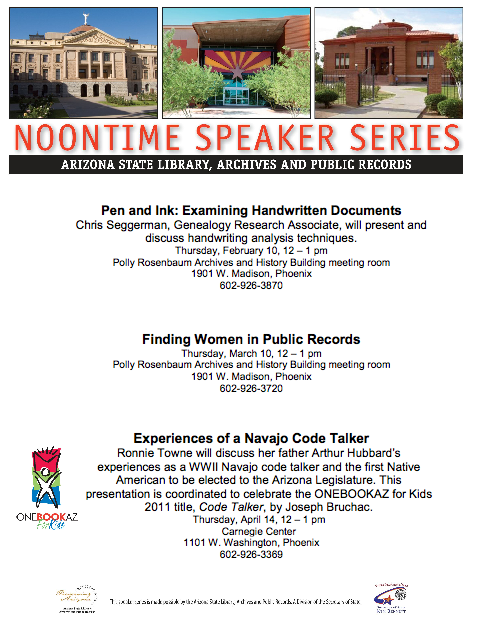 Begin 2011 with a new noontime discussion series sponsored by the Arizona State Library, Archives and Public Records! These monthly presentations on a variety of historical, literary and research topics will take place at the Capitol, Polly Archives Building or Carnegie Center on the second Thursday of every month! All presentations are from 12 to 1 PM and are free and open to the public. To see a listing of future Noontime speakers at the Carnegie for 2011, please visit http://www.lib.az.us/carnegie/speaker.aspx. Posted on February 7, 2011, in Events, History and tagged Arizona State Archives, Arizona State Library, History, Literature, Public Records, speaker series. Bookmark the permalink. Leave a comment.